Goldfields, lakes, markets, wine regions... we'll visit them all! Castlemaine this weekend, Night Market next week, and soooo much more coming up! Did you catch us on the radio last month? If you missed it you can hear our set on 3MBS here. Unfortunately it doesn't look like the recording worked for the PBS set, but hopefully you tuned in! If you'd prefer to see us in the flesh, we've got a few great gigs coming up, including our first ever appearance at the Castlemaine Jazz Festival this weekend, the Night Market next week, and more! And don't forget, if you're in SA (or South West Vic) you can catch us in July on our South Australia (& Hamilton) Tour. Tickets are selling fast for our Adelaide show, so don't miss out, book now! Read on for upcoming gig details. Hope to see you in the flesh real soon! Shirazz returns to the Queen Victoria Winter Night Market, for some steaming hot jazz music to blast the winter blues away. Enjoy some great food and drink as you browse the craft stalls and dance the night away to Shirazz. Doors open 7:30pm. Free tea & coffee available, but BYO food and drink. Booking is recommended. Call President Harry Daniels on 03 9580 2906 or 0422 657 634 to book or for more information. 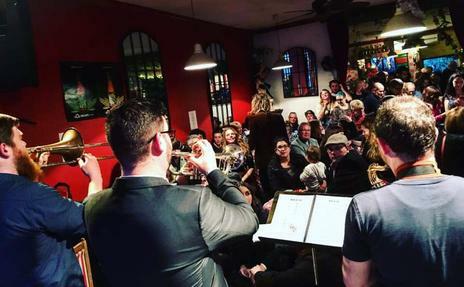 Coonawarra Vignerons are excited to be bringing back Shirazz; one of Melbourne's most sought after jazz bands specialising in classic swingin' dixieland jazz of the 20's and 30's. Coonawarra Wines and dessert available for purchase for your indulgence! Cheese platters available for pre-order when you book your tickets. Come along for a fantastic night out! Doors Open 7:30pm for 8:00pm start. Shirazz brings their New Orleans-inspired hot traditional jazz to Adelaide with one show only at the Wheatsheaf. Catch one of Melbourne's most sought after bands as they play material from their new album and plenty of old favourites. Shirazz played sell-out shows here in 2016 and 2017, so book early! Tickets are $20 + booking fee. Book now. Returning to the cosy and intimate Open Studio for a couple of sets of steamy winter jazz. Crepes available at the bar. Arrive early to get a good seat. Come and have a beer or two and enjoy some of our fitzroviest jazz tunes at the one and only Fitzroy Pinnacle. Outside if it's fair, or inside if it's not. But the jazz will be smoking no matter the weather. Copyright © 2018 Shirazz, All rights reserved.